• Do you need definitive commercial aviation sensors and switches market data? • Succinct commercial aviation sensors and switches market analysis? 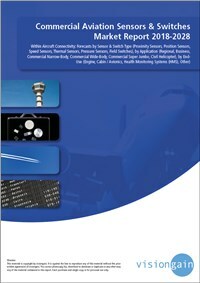 The introduction of connected aircraft in the aerospace industry has led to publish this timely report. The $685m commercial aviation sensors and switches market is expected to flourish in the next few years because of increasing demand for new aircraft across the globe and also a huge backlog of orders for commercial aircraft is expected to feed through in the latter part of the decade driving growth to new heights. If you want to be part of this growing industry, then read on to discover how you can maximise your investment potential. • What does the future hold for the commercial aviation sensors and switches industry?